I have been with CPS since 2011 and I genuinely value the culture we share. We are big enough that we have depth in our markets and tenure, but we maintain our sense of family. We are a culture of celebration too. We love to celebrate our hard work and accomplishments. 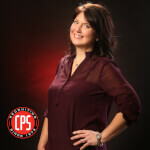 I am a Technical Recruiter in the Chemical Engineering division at CPS. I recruit and place chemical engineers nationally with our clients who are chemical manufacturers, food & beverage companies, petrochemical, pharmaceutical, and biotech companies. Prior to joining our chemical engineering division, I recruited for CPS. I was our internal recruiter, or you might know it as Talent Acquisition. While in that role, I introduced our business model to candidates, as well as screened for qualifications. One comment I always received from my candidates was they felt their interview with me was more of a conversation. I so genuinely believe in the opportunity that exists at CPS for recruiter candidates that I realized I, too, really wanted to develop a full desk in recruiting too. Outside of work, I enjoy spending time my family.